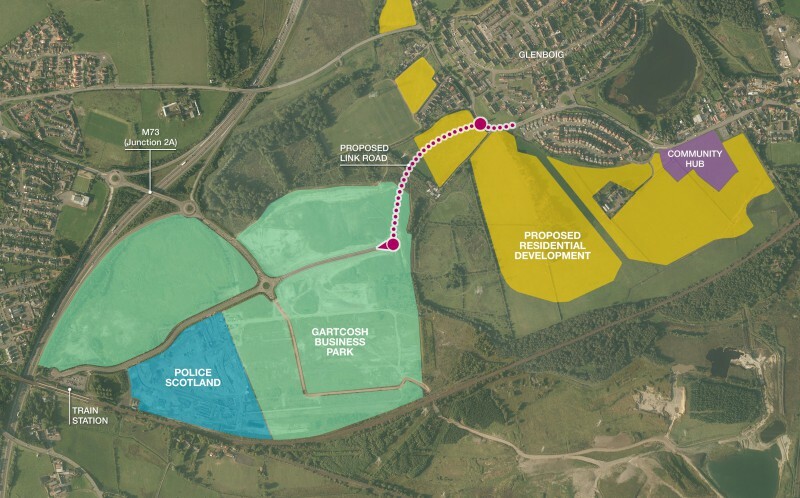 Plans for a link road that could provide direct access from a proposed property development to the Gartcosh Business Park, the local railway station and the M73 have emerged as the preferred choice by a North Lanarkshire Council. Detailed plans and diagrams have now been submitted to North Lanarkshire Council for final approval and a decision is expected sometime this summer. Banks Property, the Hamilton based employer behind the proposal, received the good news when the proposed link road was selected by the planning committee, alongside a few small traffic amendments proposed by other developers’ as part of North Lanarkshire Councils’ Community Growth Area. Bryan Johnstone, Secretary of Gartcosh Community Council welcomes the news that the Banks Property link road proposal has been selected as the preferred option. Bryan said: “Since Glenboig and Gartcosh were highlighted as a community growth area, a number of developers have set out proposals to build a substantial number of houses. “This will require a vastly improved infrastructure – which has always been a big concern locally, as congestion is already bad in certain spots – such as at the train station. The Glenboig development could see 1,040 new homes being built in the former mining village – part of a Community Growth Area identified by local planners and the Scottish Government. Banks Property, submitted the overall development proposal to the local authority in August 2014 and have now followed this up by submitting the full details of the planned link road. The Hamilton based firm has received over 60 letters of support from locals who believe the road will divert traffic away from the Gartcosh junctions and make it easier for people in both Glenboig and Gartcosh to access the key transport networks. During the construction of the road, local businesses are also set to welcome a boost as they seek to join Banks’ supply chain, resulting in new jobs and investment in the area. In total the new link road will assist the delivery of 3,000 properties created by a number of developers, delivering 2,500 constructions jobs and an estimated £1 billion boost to the economy. Colin Anderson, director at Banks Property, said: “This is a big step forward for the Glenboig property development, as the North Lanarkshire Council Planning and Transportation Committee has shown it is thinking along the same lines as we are. “We firmly believe in working with the communities that host our developments to help shape our proposals to ensure they are designed around their feedback and offer the best possible benefits to the local economy. “One of the main issues raised by local residents was the poor and indirect access to the M73. The link road we’ve proposed will not only help locals commute, but welcome visitors at the same time. “Another pertinent issue raised by many residents was the lack of investment in the area and we have committed to using local contractors and employing locally wherever possible. In an area that suffered historically from the loss of its mines, fire clay and steel works, residents can see the potential the development has to revitalise the area. During the construction of the site, local businesses are also set to welcome a boost as they are encouraged to join Banks Property’s supply chain which in turn will create a wealth of employment opportunities, estimated at 700 jobs.